Contact Rutherford County, Tennessee Personal Injury Attorney The Law Offices of John Day, P.C. Burn injuries are one of the most common accidental injuries in the United States, and despite the sometimes catastrophic and disfiguring results of these injuries, burns have a very high survival rate. Burn injury survivors often face extreme physical, emotional, and financial challenges. Burns cause excruciating physical pain and suffering. On top of the physical pain, burn injury survivors often deal with immense emotional and psychological scarring. Treating these physical and emotional injuries leads to expensive medical bills, which in turn can increase the stress on the victim. handling or consuming hot liquids. If you or a loved one has suffered a burn injury in Murfreesboro (or anywhere else in Tennessee), contact one of our award-winning lawyers for a free, no-obligation consultation on your case. 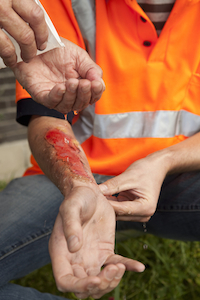 Burn injury cases are full of scientific and complex legal issues. Your case may require experts regarding the cause and origin of the fire and your future medical needs. You need a lawyer with experience in burn cases to ensure that you are fully compensated for your injuries. We handle all injury cases on a contingency basis so we only get paid if we recover money for you. Contact us at our Murfreesboro office by calling 615-867-9900 or toll-free at 866.812.8787, or fill out this online form.